In January 2017, Bahrain broke a seven-year de facto moratorium on the death penalty when the government executed three torture victims. 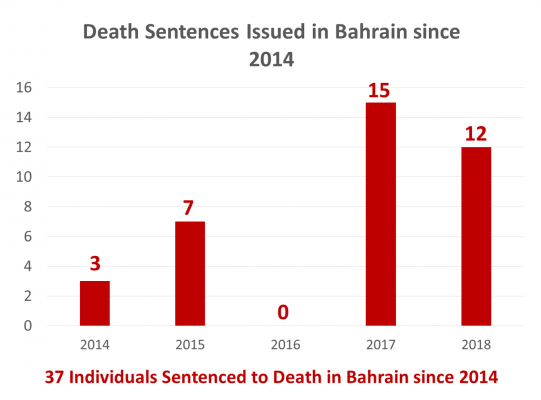 Before 2017, Bahrain’s death row population consisted of seven Bahrainis, which more than doubled when 15 Bahrainis were sentenced to death in 2017, four in absentia. Four of the death sentences were later commuted to life sentences, but an additional 12 individuals were sentenced to death in 2018, four in absentia. 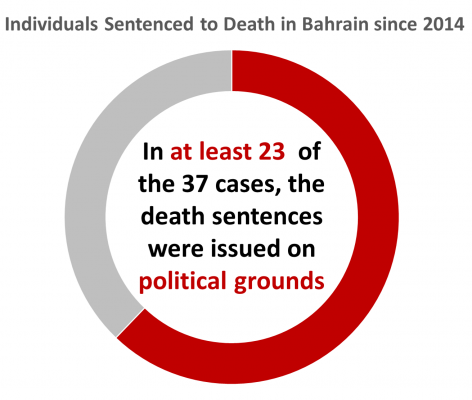 Currently, at least 20 Bahrainis are reportedly on death row, all of them sentenced in political cases. 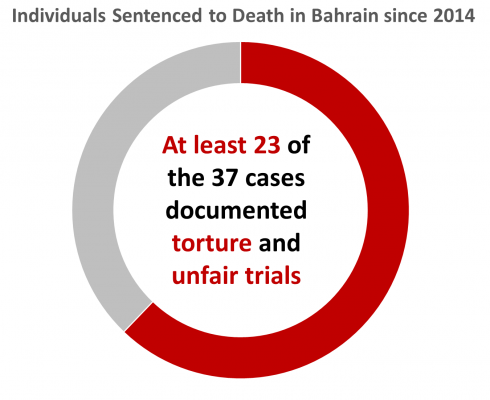 In January 2017, Bahrain’s Court of Cassation upheld the death sentences against Ali Al-Singace (21), Abbas Al-Samea (27), and Sami Mushaima (42). The men had been sentenced to death in an unfair trial in 2015. All three men were arbitrarily arrested, tortured to confess, and deprived of access to legal counsel. Despite this, the courts dismissed their lawyers’ arguments and refused to investigate their allegations of torture. They were executed less than a week after their sentences were upheld, with no prior notification given to the men or their families. They were the first people executed in Bahrain since July 2010 and the first Bahrainis executed since March 1996. Mohammed Ramadan and Husain Ali Moosa, both currently at the appeals stage, were sentenced to death in 2014 and allege they were tortured to produce confessions. Both men were subjects of an urgent 4 February 2016 resolution from the European Parliament addressing their torture and death sentences. 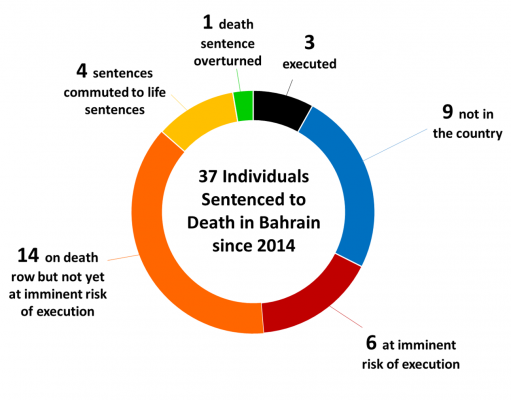 Following the executions in January 2017, Bahrain has seen a dramatic increase in the issuance of death sentences. On 6 June 2017, the kingdom’s 4th High Criminal Court issued death sentences against Sayed Ahmed al-Abbar and Husain Ali Mohamed. Both men were tortured into signing prepared confessions and are currently at risk of imminent execution. Salman Isa Ali Salman and Husain Ebrahim Ali Husain Marzooq are also at imminent risk of execution. Additionally, six of the men sentenced to death in 2017 were sentenced in the first military trial of civilians following an April 2017 amendment to remove a constitutional prohibition on the practice. Their sentences were later commuted to life sentences. On 29 January 2018, Bahrain’s Court of Cassation confirmed the death sentence against Maher Abbas al-Khabbaz. He was tortured in detention until he provided a confession. Husain Abdulla Marhoon Rashed and Moosa Abdulla Moosa Jaafar, who were tortured to provide a confession are currently awaiting a court of appeals decision. Mohammad Radhi Abdulla Hassan, Husain Abdulla Khalil Ebrahim, Ahmed Isa Ahmed Isa AlMalali, and Ali Mohamed Ali Mohamed Hakeem AlArab all await a decision from the Court of Cassation as to whether their death sentences will be confirmed. Many of these cases involved torture in detention and Ebrahim, AlMalali, and AlArab were all sentenced in absentia. On 25 December 2017, Bahrain’s Military High Court sentenced Mubarak Adel Mubarak Mahanna, Sayed Fadhel Abbas Hassan Radhi, Sayed Alawi Sayed Husain Alawi, Mohammed Abdulhassan Al Mutaghwi, Murtada Majeed Ramadan Alawi, and Habeeb Abdullah Hassan Ali to death. 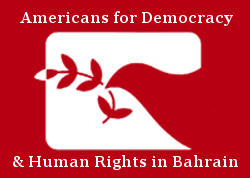 The Government of Bahrain has notably scheduled important rulings and events on dates that the US and European governments will not be paying close attention, including, and especially holidays. 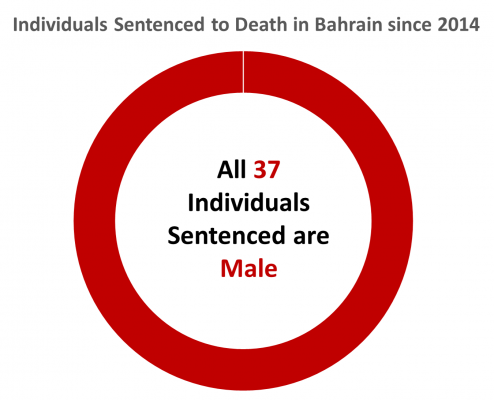 Bahrain’s use of capital punishment has caught the attention of the United Nations (UN). Due to the circumstances surrounding the January 2017 executions, the UN Special Rapporteur declared the executions to be extrajudicial in nature, highlighting the government’s use of “torture, unfair trial and flimsy evidence” in securing their convictions. The UN Office of the High Commissioner for Human Rights also released a statement expressing sincere concern for the individuals’ torture, unfair trial, and ultimate execution. Additionally, in December 2018 Special Procedures sent a communication on 20 of the individuals sentenced to death in Bahrain. Bahrain’s National Institution for Human Rights (NIHR) is cited as the kingdom’s key monitoring institution on human rights. However, the NIHR functions as an extension of the government, as it lacks independence, and has even supported the execution of prisoners of conscience on multiple occasions. January 2017 – The NIHR supported the executions of torture victims Ali Al-Singace, Abbas Al-Samea, and Sami Mushaima. A statement from the NIHR deemed the executions as being “in accordance with recognized international standards,” despite credible allegations of torture and due process violations. Launch an investigation into the cases of individuals sentenced to death who allege due process violations and torture in their trial and detention.